Certainly there can be no harder task than to name the single best from so many perfect, yet different, beaches. We still love walking that beach. What is your top spot for sand, sun and swim? Click here to share your favorite! The sand is so powdery and stretches a mile, comes to a point with some fantastic reefs, and then goes another mile. 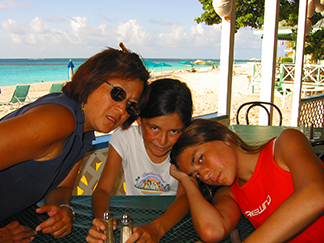 Several good beach bars (I think that's why my dad first fell in love with Anguilla! 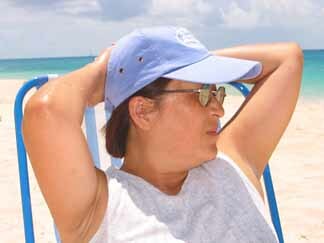 ), not to mention terrific, open-air restaurants right on the beach. The food was great, and is still excellent today. You won't find a place that's more on the beach. Have their grilled snapper sandwich! My sister and mother both swear by the ribs, too. This beach is also known for its outstanding snorkeling! And you probably do not know what it is most UNknown for! Click here to visit the virtually deserted end of the biggest and best of all Anguilla Beaches. For more Shoal Bay East, "fly over" the sea and sand with the video below! 2) "Funkiest" Beach... Sandy Ground. I put "funkiest" in quotes because that's what my dad calls it. I just think it's a cool place. People from around the world dock their boats here when they visit. 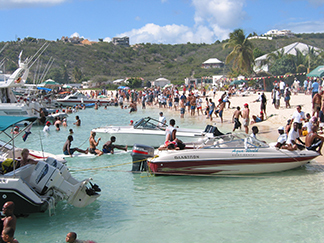 There are a heck of a lot of boats and people crowding this coolest of Anguilla beaches. As a matter of fact, it's one big gigantic party! It's Anguilla's biggest party... bigger even than Christmas!! 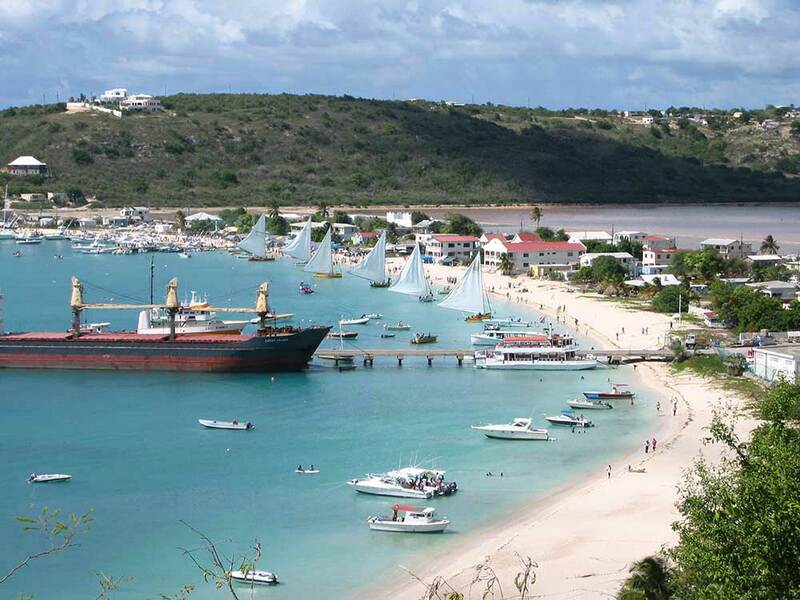 It's Anguilla Carnival's August Monday boat races, which you can read more about by clicking this link. Usually, Sandy Ground is a lot slower with a few foreign sailors docked and the occasional huge container ship. If you like to dance, drink and party, don't miss Johnno's by day and Pumphouse by night. 3) My Personal Favorite... Barnes Bay. Of all the Anguilla beaches, it used to be that you would hardly ever see anybody here. Barnes Bay was truly a secluded beach. The beach is more populated now since Viceroy Anguilla resort (today Four Seasons Anguilla) first opened in 2009. The property straddles both Barnes Bay and meads Bay. Back in 2002, our villa was between two luxury villas that cost over $3,000 per night! Now, with Four Seasons, there are many more high-end accommodation options on Barnes Bay. Still, there are three great little snorkeling areas! Most of all though, I really feel comfortable on this beach. Maybe I am a little biased after all. Anguilla beaches do that to you! the water of my personal favorite! Of all of the 33 Anguilla beaches, these are my top 3. If you pushed me to name only one, I'd have to say Barnes Bay... but then again, I am biased. The Best Caribbean Beach? 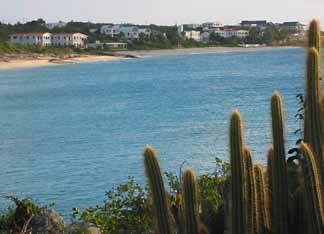 Here's Anguilla's #1! What's the #1 Anguilla beach? We compiled a list of favorites, asking you to cast your vote. 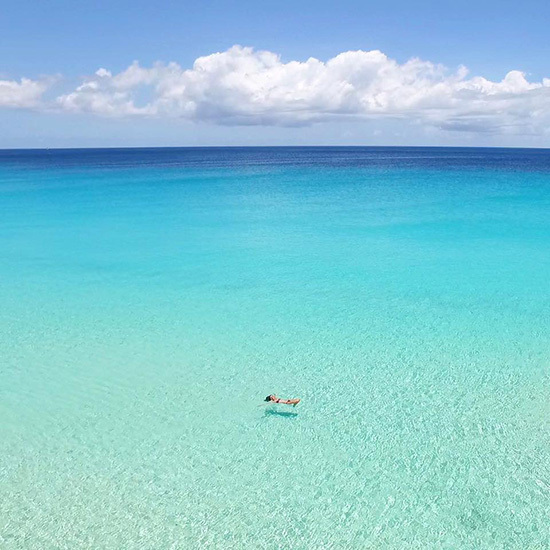 Here are the results for BEST Anguilla beach and what can very well be considered to be the best Caribbean beach, too. Free to cast your vote via the link above! Kristin Bourne reports on each of her long beach walks, providing an in-depth look at Anguilla's most pristine beaches! Sandy Ground Beach: Sandy Ground beach truly captures the essence of Anguilla... From the history and island flavor, the bustle of boats, the tasty eateries, local bars, and nightlife, Sandy Ground is one of the best Anguilla beaches. 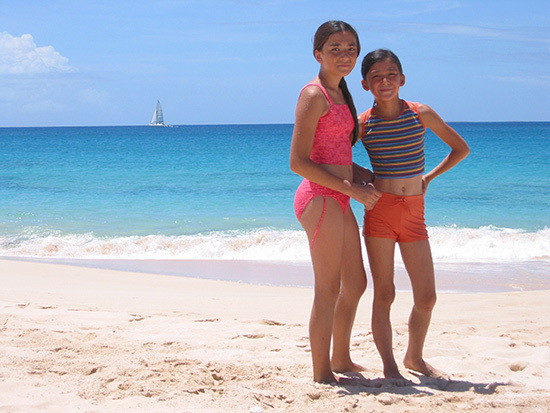 Shoal Bay Anguilla Beach: The top-ranked beach in Anguilla, the Caribbean and even the world. My friend Kristin Bourne takes us on a virtual walking tour of the beach from west to east, stopping in at every establishment. Meads Bay Anguilla: Meads Bay is one of the island's most wide, expansive and visually impressive beaches. With many options for accommodations and restaurants, it's no wonder why Meads Bay is a loyally loved beach. Little Bay Anguilla: Little Bay is one of Anguilla's most remote and rewarding beaches, accessed only by rope or by boat. It is a special spot for relaxing, snorkeling and more adventurous pursuits too, like rock-diving! 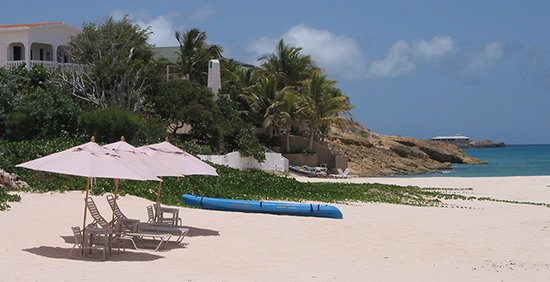 Rendezvous Bay Anguilla: Rendezvous Bay is amongst Anguilla's most impressive big beaches. 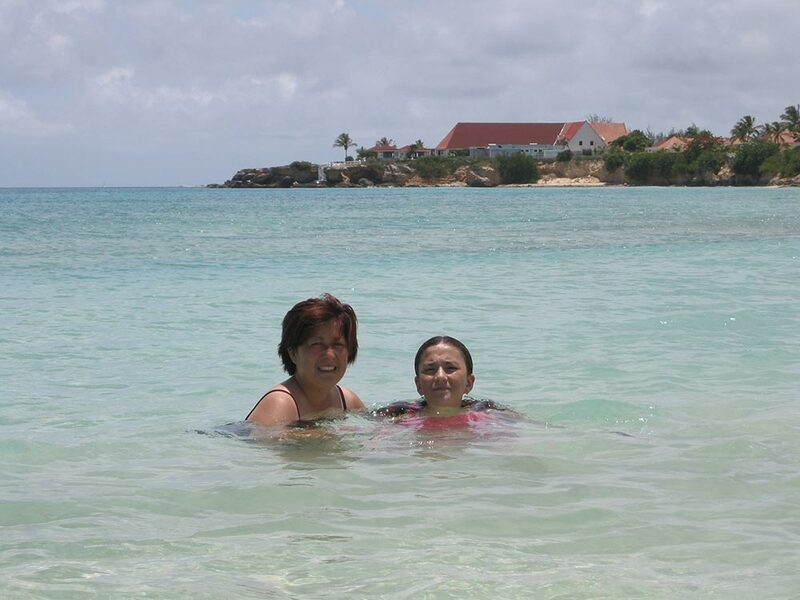 Long, wide and expansive, with sparkling seas, soft sand and a St. Martin backdrop, this beach soothes the soul. It is also home to the world's #1 beach bar, as rated by CNN. Island Harbour: Island Harbour is a charming fishing village located on the island's east side. Pretty fishing boats dot its crystal clear waters, local children sail Sunfish, and picturesque Scilly Cay lies in the distance. Surrounded by a few tasty eateries, Island Harbour is not to be missed. Cove Bay: Home to just one establishment (Smokey's restaurant) and one wharf, Cove Bay is an untouched gem. With clear views to St. Martin, calm seas, smooth sands and rolling dunes, it's not hard to see why "The Cove" is loved by all. Shoal Bay West: Not to be confused with its ever popular cousin, Shoal Bay East, Shoal Bay West is tucked on the complete opposite end of the island. Smaller in size, it is equal in beauty with a completely different view, pace and feel. Barnes Bay: Tranquil and upscale, though many businesses call Barnes Bay's shores home (Four Seasons Anguilla, Mango's Seaside Grill, Caribella and a number of private villas), you rarely spot other beach goers on this slice of Anguilla perfection. Captain's Bay: Hard to get to and notorious for its big waves and powerful undertow, Captain's Bay is an undiscovered gem. With just one villa gracing its shores, it's the perfect spot to watch the waves roll in, marvel at whales playing in the bay (if you get lucky and depending on the season!) and simply get absorbed in the beach's natural beauty. Savannah Bay: Big, beautiful, remote, natural... Savannah Bay is a rarity in today's day and age. Anguilla's least developed sandy beach, visit for a day of beach walks, beachcombing and delicious crayfish lunch at the only establishment on the beach - Nat's. Perhaps Anguilla's most overlooked and rarely visited "big beach," Long Bay is a fascinating combination of a wide, long stretch of beach and breathtaking hidden coves. Wonderful walking beach, nice resorts to stop in, and Blanchard's is here. This is the beach we most enjoy simply walking upon. Dear old Dad almost "bit the dust" here. Literally. Calm and you're rarely more than knee-deep. But you'll see fish! For those times when you can't be here and it's snowing at home! My Dad's favorite water sport! The island is known for their beautiful beaches. But other stunning bodies of water are calm, breath taking, and ideal spots for bird watching. 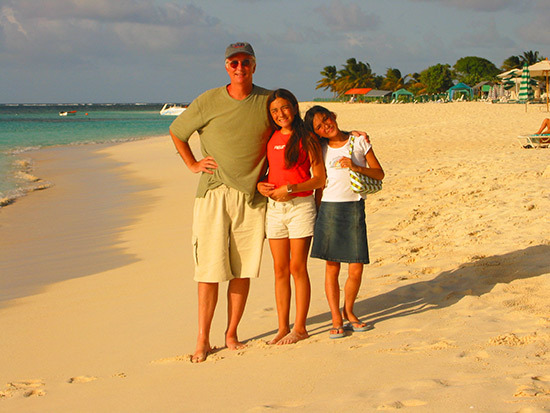 Of course our family loves Anguilla beaches, but what about the rest of the world's beaches? Here are our top ten, complete with photos, outside of Anguilla. Click here to read about our favorite beaches around the world. What's Your Favorite Anguilla Beach? When all is said and done, Anguilla is about its beaches. Each is flawless, perfect in its own way, each with its own character that causes each of us to have a favorite. What's yours? Do you have a photo of your favorite beach? Great! Click the button and find it on your computer. Then select it. Click here to see the rest of the form and to share your favorite Anguilla beach. Click on the links below to read about other visitors' favorite Anguilla beaches. Meads Bay Is For Me! Savannah Bay Since The 70s!